This centerpiece bowl forms part of a select group of silver fashioned in the Egyptian revival style of the early 19th century. Archaeological discoveries and territorial conquests in the Nile, publications such as Vivant Denon's Voyage dans la Basse et la Haute Egypte of 1802 and the promotion by connoisseurs such as Thomas Hope led to a fashion for the Egyptian taste. The Royal goldsmiths Rundell, Bridge and Rundell were responsible for manufacturing the most opulent examples in silver, such as the Prince Regent's Royal Grand Service. J.J. Boileau, a French mural painter who turned his hand to silver designs in the early 19th century for Rundell's, designed numerous pieces in the Egyptian taste, evidenced by design drawings now in the Victoria and Albert Museum. A pair of 1805 fruit coolers by Scott and Smith, based on a Boileau design sold at Christie's, New York, October 20, 1999, lot 184, and a set of four wine coolers in the Egyptian taste, circa 1810, with the retail signature of Rundell, Bridge and Rundell, were sold from the Marcos Collection in the same Rooms January 10-11, 1991, lot 53. This exotic centerpiece bowl, however, is most closely affiliated with a group of tea urns, one of which originally belonged to Thomas Hope. A tea urn with the maker's mark of Scott and Smith, 1806 is illustrated in A. Phillips and J. Sloane, Antiquity Revisited: English and French Silver-Gilt from the Collection of Audrey Love, p. 8, figure 3, and another, with slight variations in design, in Michael Snodin's "J. J. Boileau: A Forgotten Designer of Silver," Connoisseur, May-Aug 1978, p. 124.) 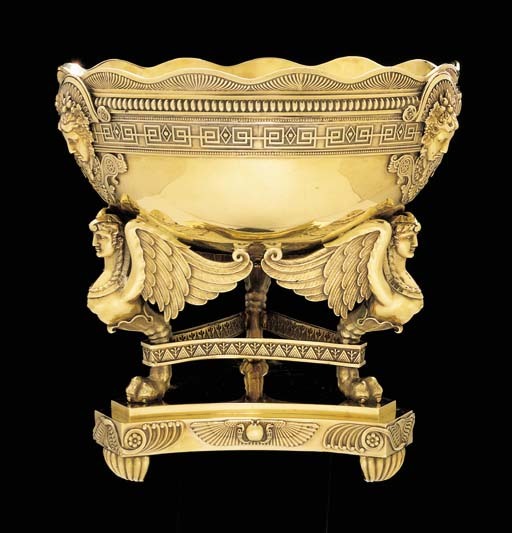 Like the centerpiece bowl, the urns share winged sphinx supports, sundisks and applied Apollo masks. Given the variation in design with the tea urns, it appears that Paul Storr adapted the earlier Scott and Smith design for Rundell's, substituting a bowl for the urn.